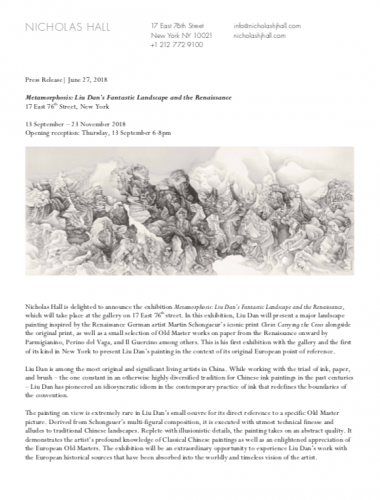 Nicholas Hall is delighted to announce the exhibition Metamorphosis: Liu Dan’s Fantastic Landscape and the Renaissance, which will take place at the gallery on 17 East 76th street. In this exhibition, Liu Dan will present a major landscape painting inspired by the Renaissance German artist Martin Schongaeur’s iconic print Christ Carrying the Cross alongside the original print, as well as a small selection of Old Master works on paper from the Renaissance onward by Parmigianino, Perino del Vaga, and Il Guercino among others. This is his first exhibition with the gallery and the first of its kind in New York to present Liu Dan’s painting in the context of its original European point of reference. On occasion of the exhibition, a catalogue will be published by the gallery, which will include new scholarship by the distinguished art historian Robert E. Harrist, Jr., Jane and Leopold Swergold Professor of Chinese Art History at Columbia University. Concurrent to the show, Nicholas Hall is curating for David Zwirner’s 20th Street space Endless Enigma: Eight Centuries of Fantastic Art. The exhibition will be on view at 537W 20th Street, New York from September 12 to October 27. Born in Nanjing, China in 1953, Liu Dan currently works and resides in Beijing. He lived in the United States between the early 1980s and 2005 before retuning to China. Public collections with his works include The British Museum, London; Musée Guimét, Paris; Andrew Mellon Foundation, New York; The Arthur M. Sackler Museum of the Harvard University Art Museums, Cambridge, Massachusetts; The Brooklyn Museum, New York; the Minneapolis Institute of Art, Minneapolis and so forth. Recent museum exhibitions include Art and China After 1989: Theater of the World (Solomon R. Guggenheim Museum, New York, 2017); Ink Unbound: Paintings by Liu Dan(Minneapolis Institute of Art, Minneapolis, 2016); Liu Dan: New Landscapes and Old Masters (Ashmolean Museum of Art and Archeology, Oxford, 2016). Established in 2016, NICHOLAS HALL is an appointment-only gallery on the Upper East Side of New York. The gallery deals in museum-quality works by European artists from the 13th to mid-20th century and provides bespoke advisory services for the discerning collector. Before founding his eponymous gallery, Nicholas was the International Chairman of the Old Master and Nineteenth-Century Departments at Christie’s. His first gallery, Hall & Knight, was acquired by Christie’s in 2004.